For our Chinese New Year dinner party, my friend Tricia prepared these potstickers! They were delicious with a good balance of filling and dough! For really good potstickers, the two part cooking process is important. The potstickers are first boiled to cook the dough and filling... and then pan fried for a nice crisp crust. Combine the first 10 ingredients in a large bowl, using your fingers to mix everything together. (Note: If preparing the filling ahead of time, store in a sealed container in the refrigerator until ready to use). Fill each wrapper with a heaping teaspoon of the pork filling. Add the filling in the middle of the potsticker wrapper, using your finger to spread it out toward the sides. Be sure not to overfill or to spread the filling too close to the edge of the wrapper. To fold the dumpling, moisten the edges of the wrapper with the egg white or mixture of water and cornstarch (this makes it easier to seal). Gently lift the edges of the moistened wrapper over the filling. Crimp the edges of the wrapper and pinch together to seal. (Cover the remaining wrappers with a damp cloth to keep them from drying out while filling and folding the dumplings). Heat a wok or nonstick skillet on medium-high heat and add 1 tablespoon oil. Add 10 – 12 potstickers, and cook for 2 to 3 minutes, until the bottom is browned. Add 1/3 cup water, cover, and steam the dumplings until the liquid is absorbed (about 5 minutes). Remove and cook the remainder of the dumplings. Serve alone, with Dumpling Dipping Sauce, hot chili oil, or with soy sauce combined with freshly chopped ginger or a few drops of Asian sesame oil. These look so good! The picture makes me want one right now. I studied abroad in China, so I am always looking for good dumpling recipes - now I have this one starred. 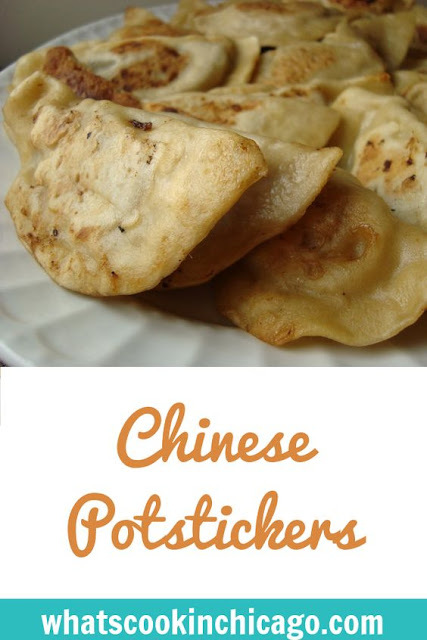 I love pot stickers, but I've never tried to make them myself. Thanks for posting!